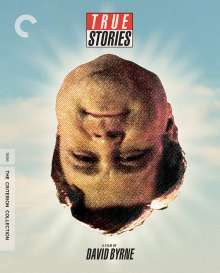 Der Artikel True Stories (1986) (Blu-ray) (UK Import) wurde in den Warenkorb gelegt. Musik / Komödie, 89 Min. Music icon David Byrne was inspired by tabloid headlines to make his sole foray into feature-film directing, an ode to the extraordinariness of ordinary American life and a distillation of what was in his own idiosyncratic mind. The Talking Heads front man plays a visitor to Virgil, Texas, who introduces us to the citizens of the town during preparations for its Celebration of Specialness. As shot by cinematographer Ed Lachman, Texas becomes a hyperrealistic late-capitalist landscape of endless vistas, shopping malls, and prefab metal buildings. In True Stories, Byrne uses his songs to stitch together pop iconography, voodoo rituals, and a singular variety show—all in the service of uncovering the rich mysteries that lurk under the surface of everyday experience. RoRoFilmlexikon: "Optisch ergeiziger und musikalisch vielfältiger Rockmusik-Film um die Beziehung zwischen originellen Kleinbürgern in einem Städtchen in Texas."